This German made Merkur shaving razor provides a smooth shave for all users. The perfectly balanced weight of this razor does all the work for you, greatly reducing nicks, ingrown hairs, and razor burn. 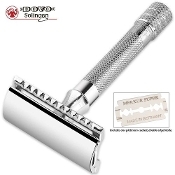 This polished chrome-plated razor includes a rust resistant platinum coated double-edged blade.